My family has a big thing for pizza. Since I remember Daddy was making his version of it, which never really was my kind of a treat – there was a thick layer of stewed onion, no tomato sauce and too much cheese. 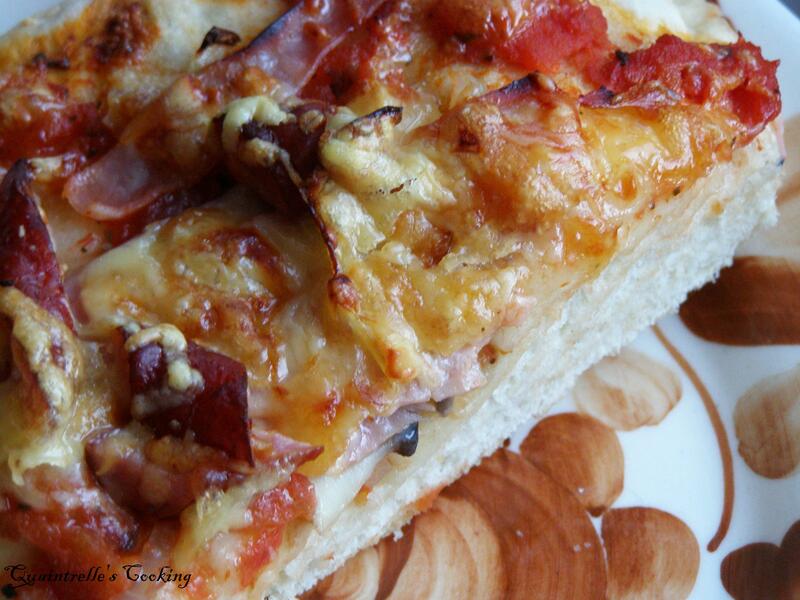 I like the thin Italian style pizza, which I find very tempting and delicious. When visiting Mr. Strange this year, we had pizza every day and it was always mind blowing. Of course food is much more about community than anything else, so if I’m making pizza home is always needs to be on foccacia like base, as that’s my Mom’s favourite… go figure..
My family still didn’t recognize mozzarella as a pizza cheese, and again since the idea was born today and I shouldn’t go out just yet, the regular cheese won. 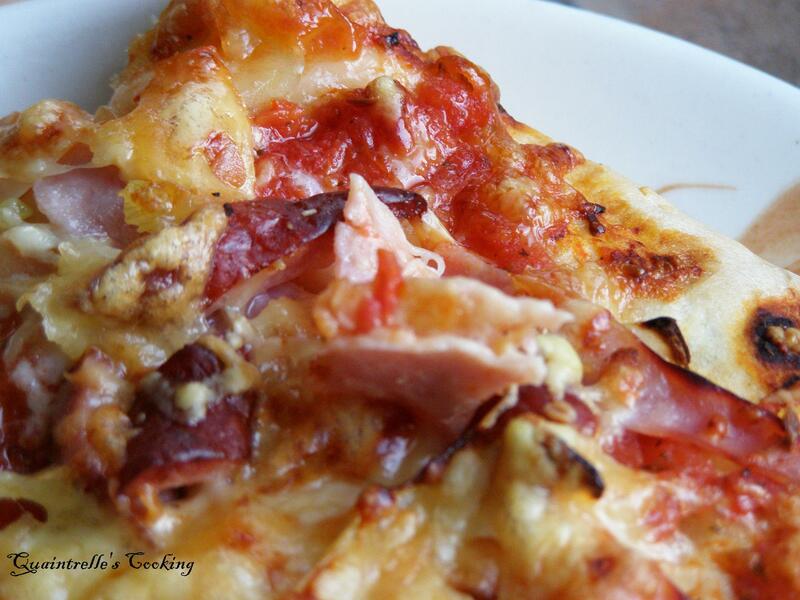 So my pizza is full of natural colours – the redness of tomatos, the pink of ham and frankfurters (we had an opened pack in the fridge and thought – those would be lovely under the layer of melted cheese) and finally the yellow of three different kinds of cheese. I decided to mingle them for a better melt and better taste. The crust is nice and fluffy, with an adding of Nigella seed – which are slightly spicey and give a lovely taste to the bread. 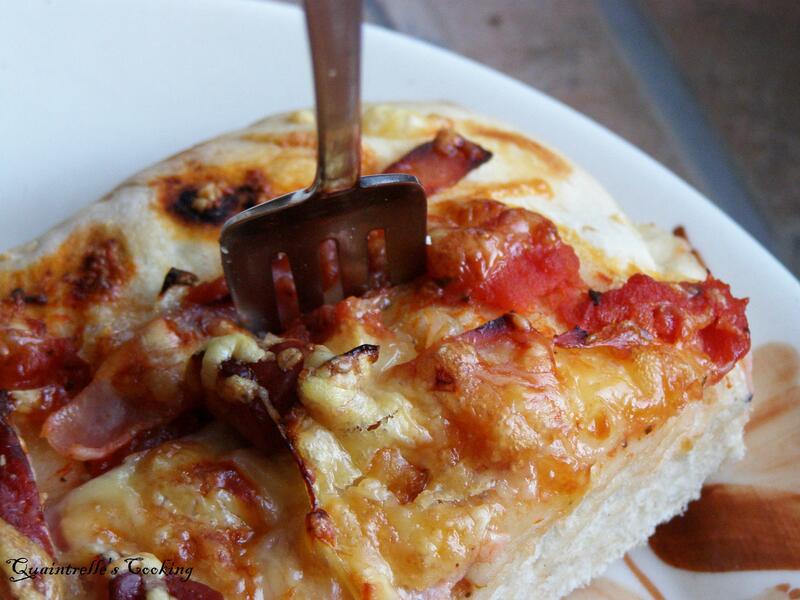 That’s the most classical home-made pizza. No fuss, no special techniques just pure comfort for the winter days. When I used to live in Switzerland and used to be married (yes long long long time ago, and no thank you I’m still quite young), pizza was our comfort food after a long day at work or sth. When I was visiting Mr. Strange pizza was a treat of Italy for me, and a glass of wine with my best friend… you see food is all about emotions to me. In the bowl mix together water with yeats, add a handful or two flour and a pinch of sugar, stir well until thick and creamy. Set covered with the fresh cotton towel for at least 15 minutes, but 30 preferably. When the starter is fluffy and bubbly (little yeats are busy feeding on sugar and flour), sift in abnout 3/4 of flour and stir until nice and sticky. Transfer to the working surface and work the dough adding flour as you go. Until the dough is nice and shiny and doesn’t stick to the hand. Now the fun begins. Carry on working on dough, rolling it and folding as many times as you feel the dough is just right – it should have nice bubbly structure when touched. Don’t forget to give it a nice whack on the working surface as you go. It’s important to work in as much air as possible, and then distroy and reconstruct the connection between the cells of gluten. When nice and bubbly, and fluffy but shiny and not sticky, form the ball and give it a rub of olive oil. Transfer back to the oiled bowl and cover the bowl with a clean towel. Let it rise for at least 30-40 mins. Then fold the dough and add the Nigella seeds, transfer them well by good kned :). Let rise for another 30-40 mins. Take your crust and spread it on the oiled tray. 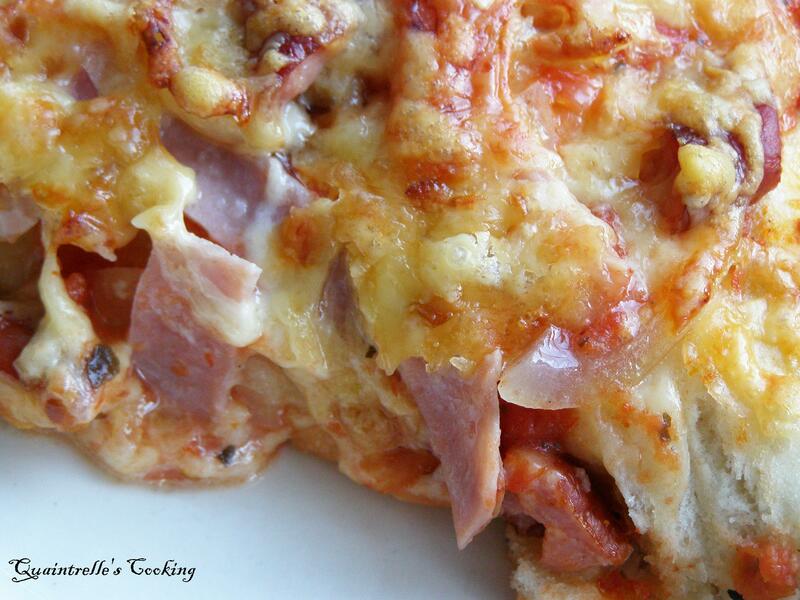 Put tomato sauce, then onion, mushrooms, meat and then top with a thick layer of cheese. Put into preheated to 220C oven with fan (then it’s 200C as the fan/pizza function fan gives extra 20C). And bake for about 30 mins. This entry was posted in baking, bread, cheese, food talk, frankfurters, ham, International Incident Party, mushroom, pizza, pork, recipe, soul food, Switzerland, tomato, yeats and tagged bread, cheese, international incident party, nigella seeds, pizza, yeats. Bookmark the permalink. 11 Responses to Everyone’s Doing That, So Why Shouldn’t I? best looking pizza i’ve seen in a long time. can you do a delivery service to england??? yes, kitchen is ready for you and bed will be made up for sleepover! This sounds delicious but take care of yourself! What a rock star to be cooking when sick. Hope you’ll be on the mend soon! Thank you very much! Yes I’m on the mend but it does take time 😦 and cooking is always making me happy! 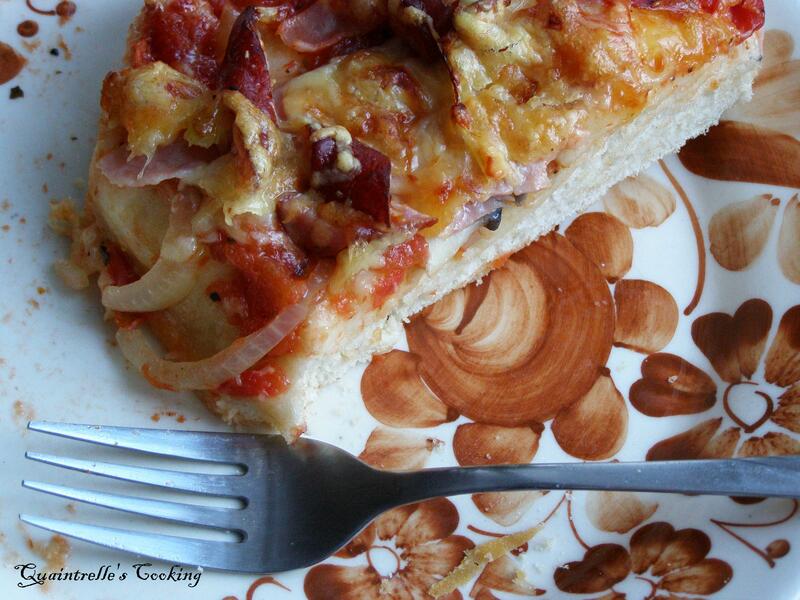 Bravo for making this colorful pizza when you’re so under the weather! It’s a testament of your commitment to the party, and we’re all glad you could join in. Thanks Clint, will look into that. They are properly linked via wordpress, but one never knows what technology can came up with. Thanks again!